Shea-Lynn Gioia is 12. She traveled eight hours to compete in her first CrossFit event. Shea, her parents, and her coach made the trip to CrossFit Firepower, a hub for CrossFit Kids seminars in Milton, Ont. 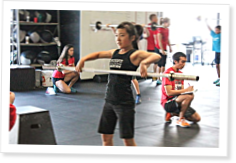 Shea is joining 30 other kids aged 12-18 for one of the first CrossFit Kids Gauntlet competitions held outside California. Over two weekends in May, 10 gauntlet events were held worldwide. Shea identifies herself as a CrossFit athlete, though she also competes in track and field and just broke a city record in the 100 meters and high jump. Shea also just qualified for the provincial basketball team and used to dance competitively but didn’t like it. She tried gymnastics with the same result. Other athletes at the Gauntlet include an 18-year-old junior-level hockey player, a 12-year-old soccer player, and runners, volleyball players and gymnasts of various ages. Most compete in other sports; many say they’d choose CrossFit as their primary activity over their “main sport.” Some parents claim that CrossFit Kids has given their child the courage to try other things without fear of failure. Some of the top adult CrossFit athletes in the world have been training for fewer than three years. Some of these kids already have more experience. How great could these athletes become as they grow up with CrossFit? What if everything we “know” about resistance training for children is based on myth? Chris Cooper investigates.